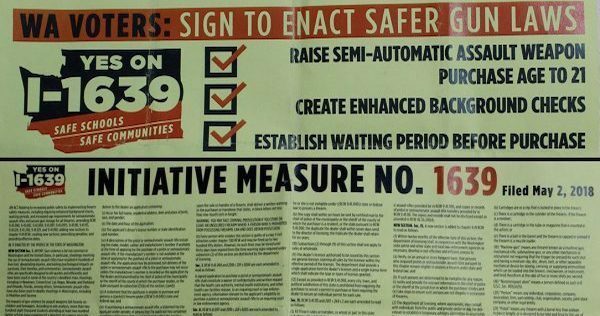 A Thurston County Superior Court judge ruled that petitions sheets used for I-1639, the Alliance for Gun Responsibility’s gun initiative, did not comply with Washington State law and ordered the Secretary of State’s office to end its certification. Judge James Dixon issued the ruling Friday morning. At the end of July, the Secretary of State’s office announced the official certification of I-1639. The same day of it’s certification for the November ballot, Alan Gottlieb, founder and Executive Vice President of the Second Amendment Foundation, filed a lawsuit against Secretary of State Kim Wyman challenging the legitimacy of the initiative. 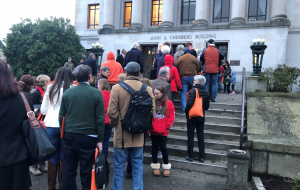 The lawsuit claims the petitions used to gather signatures for I-1639 did not use a “full, true, and correct copy” of the initiative. The language did not underline all new additions to the law, or strike through all language amended by the initiative, as is required by state election law. Judge Dixon agreed that the changes were not clearly marked and noted that the text on the petition sheets was too small. Gottlieb’s lawsuit wasn’t the first challenge to the legitimacy of I-1639. In June, the Second Amendment Foundation and the Citizens Committee for the Right to Bear Arms filed a petition claiming the language use on the petitions wasn’t complete, but a Washington Supreme Court commissioner dismissed the filing. The ruling has already been appealed and will head to the State Supreme Court where a quick decision will need to be made in order to finalize ballots for November.